LTM's small farm is completely off the grid. Her family uses solar and alternative power sources for lighting, cooking, animal fencing, etc. When my family started living off the grid, I quickly learned that cooking in an off-grid kitchen is very different to how most people cook. If you no longer have access to a seemingly never-ending supply of mainstream electricity, you need to look for off grid kitchen appliances. So what do you need to know if you are planning to attempt off grid cooking? What are the best off grid kitchen appliances? Here's a few thoughts I hope you find helpful. One of your main goals, winter or summer, should be to reduce your reliance on any kind of fossil fuel. 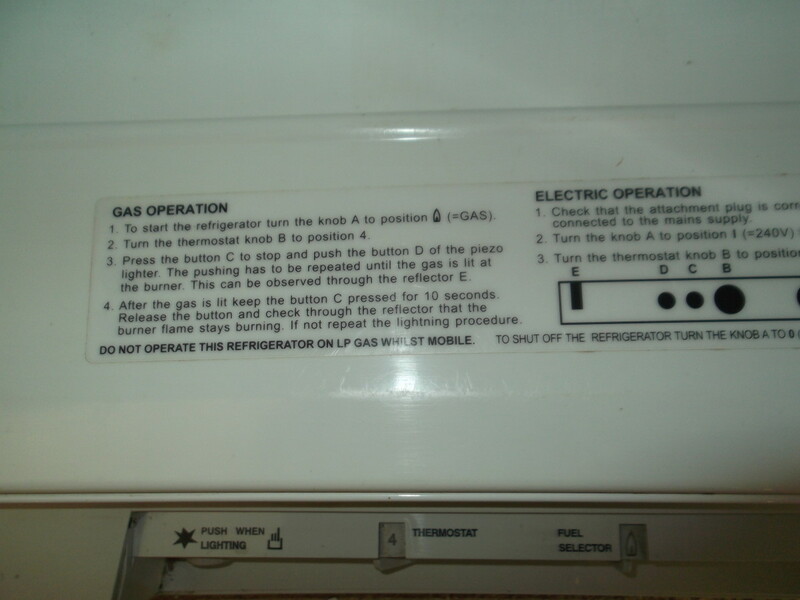 If a kitchen appliance requires petrol, coal or natural gas directly or indirectly to power it, look for an alternative. In an ideal world we would never turn on a generator and would manage to survive without even the need to burn wood. But that's not going to happen where I live anytime soon. Perhaps if I could harness solar power, wind power, hydro power and produce enough methane to cover all my power requirements 365 days of the year, I would consider getting rid of my generator and my wood burning stoves. 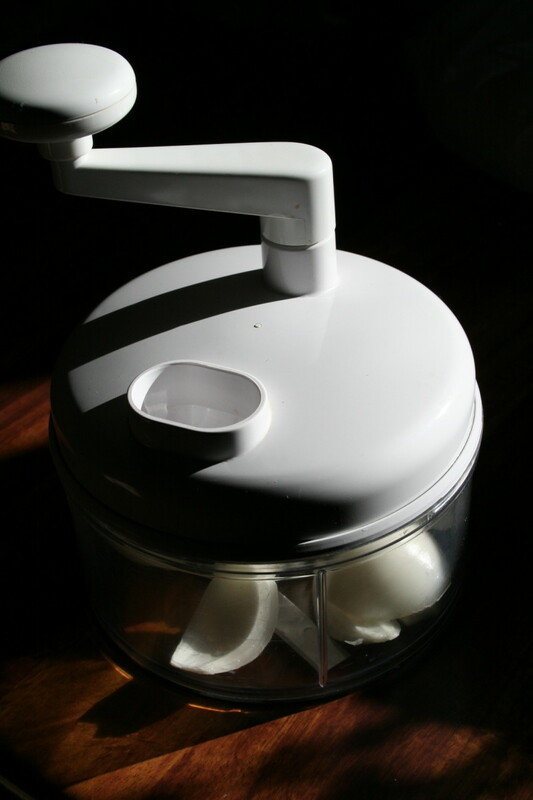 People power - many of my off grid kitchen appliances require a bit of manual effort. Fire - in winter I cook on the same wood-burning stove we use to heat our home. Electricity - my deep cell solar storage batteries provide electricity to our house, but I don't like to waste electricity in the kitchen. Generator - In dreadful weather when I turn the generator on to top up the solar storage batteries, I might run a lead directly from the generator to power a rarely used electrical appliance in the kitchen. Propane gas - powered the refrigerator before our recent solar battery upgrade (which can now take care of the fridge), and a small LPG bottle is on stand-by near our barbecue. Fortunately my efforts to live a green lifestyle result in me saving a lot of money. I love never paying an electricity bill, and the amount of fuel I need to buy for my generator is minimal. Most days I receive enough sun on my solar panels to charge my deep cell batteries. My solar oven provides cost-free cooking in the summer. My Weber barbecue can be cooked with an open lid, like a traditional barbecue ... or with the lid closed, acting more like an oven. It runs on LPG (propane) but because it is only relatively small, it doesn't need much to cook a meal. I rarely use it. There was initial expense in purchasing off-grid appliances and setting up my off-grid kitchen, but I cook without needing to connect to the mainstream electricity grid every day of the year ... so now I cook for free. Cooking in modern kitchens requires plugging in an appliance to complete most tasks. 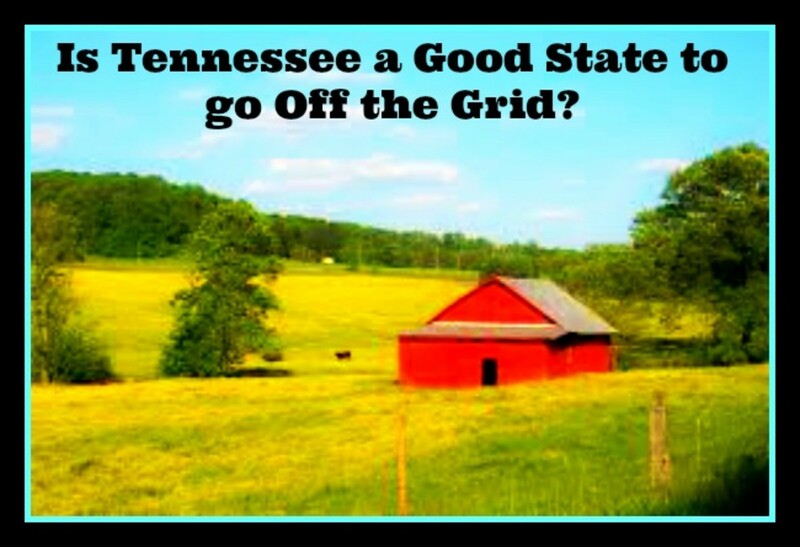 Your reliance on electricity must change when you are cooking off the grid! If you spend enough money having a large solar system installed, you can still use an electric toaster and a bread-making machine, but most of us living off the grid tend to start small. I plan to continue upgrading my solar system and the amount of power I can store in my deep cell batteries, but I have no intention of upgrading my trusty kitchen implements or appliances. 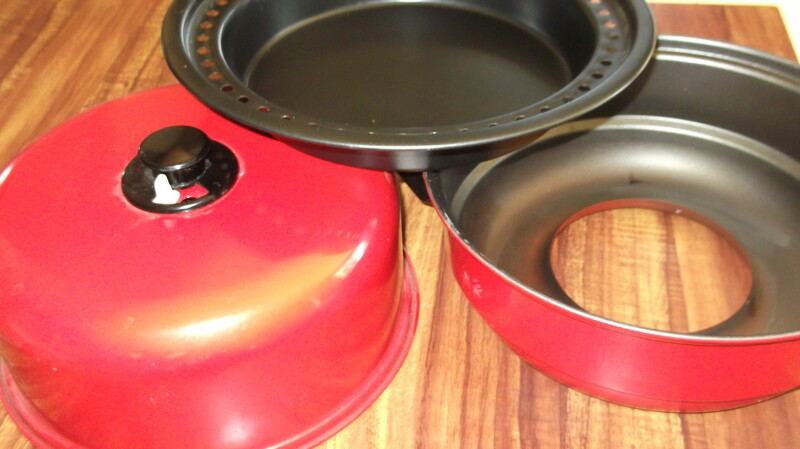 The best off-grid kitchen appliances do not require electricity to operate them. Your grandmother and your great-grandmother used wooden spoons to mix and stir ingredients in a bowl that sat on the bench, or was cupped with one arm while they walked around the kitchen. Lemons and oranges were juiced using muscle power, pushing down on a juicer that did not require electricity. Cheese was grated on a metal grater. Vegetables were chopped with a knife. I enjoy the earthy, genuine feel that comes with using the same type of simple implements and appliance for off-grid cooking as my grandmother used in the days when she relied more on wood than electricity. It makes me feel far more connected with the food itself and inspires respect for the marvels of nature that make organic foods available to me. If you are going to buy a mortar and pestle, choose one like mine. Big, heavy, and made of stone. Why? Because you want it to remain sturdy on your benchtop as you crush your basil or your peppercorns. I don't understand why anyone would choose to buy a light, ceramic mortar and pestle. There's a good chance you'll break the bowl, or send it flying across the kitchen if you get carried away. 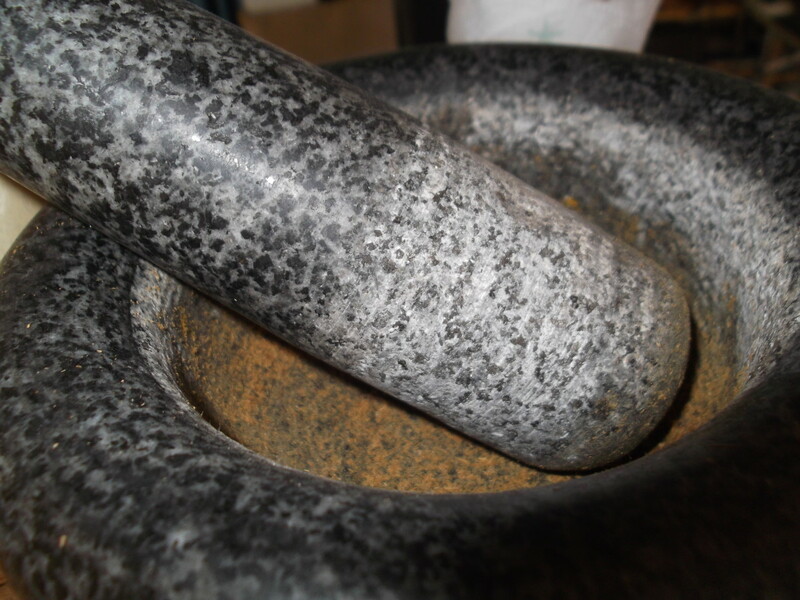 An authentic mortar and pestle should never be washed in a sink or dishwashing machine. You can wipe it clean with a damp cloth when you're finished or, if you use it as often as I do, there's no harm in leaving the lovely smell of freshly ground herbs and spices to emanate through the kitchen. To thoroughly clean it occasionally, I pound and grind uncooked rice; the traditional method of cleaning a stone mortar. Electrical appliances that generate heat have no place in your home when you are living off the grid, so forget about an electric oven, kettle and toaster. During winter it is lovely to keep a kettle filled with water, bubbling on top of the top of a wood burner stove. The steam adds a little humidity to the air, making it nicer and more comfortable than very dry air. 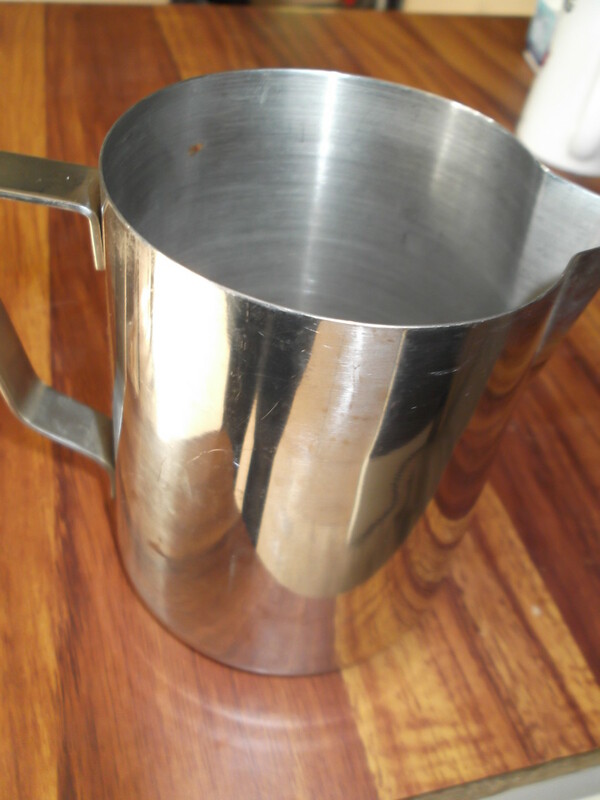 Watch out for a flat-bottomed kettle (stainless steel) with a whistle that can be removed, or no whistle at all. The flat bottom is important so that it can sit on cast iron. A quick and easy way to boil a small amount of water, or warm some milk, or reheat some soup, is to use the same type of stainless steel jug baristas use when making espresso coffee. They come in various sizes. Simple to use. Simple to clean. Simple to store. That's what you aim for when selecting appliances and other items for your off-grid kitchen. People who choose to live off the grid are generally seeking an entire lifestyle change. Many of today's off-gridders are growing their own food and seeking a more healthy, green lifestyle in general. 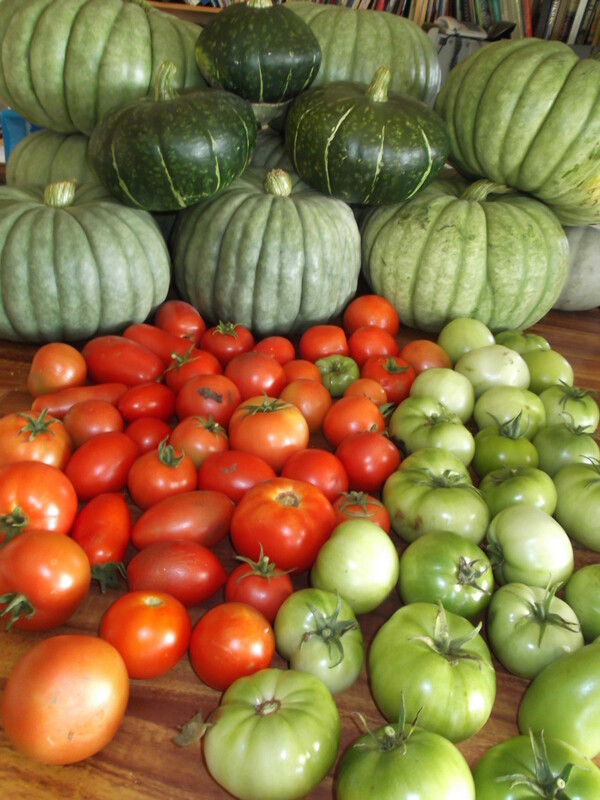 The photo above shows just one day's harvest of pumpkins and tomatoes on one of my benches. Where would you put fresh produce in your kitchen? Do you have enough tables or benches? If you like the idea of canning extra fresh fruit and vegetables, would your off-grid kitchen still have room for cleaning, chopping, cooking, bottling, (and leaving the jars or bottles to cool) ... while preparing dinner at the same time? 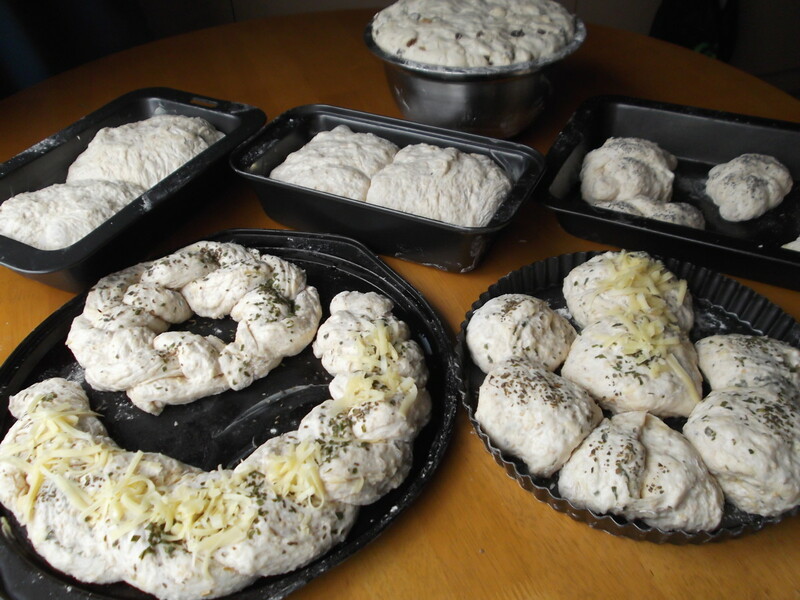 Occasionally I will mix enough dough for just one meal; bread or pizza bases. For the most part, however, I create a week's bread at a time. That process requires more benches and tables than you'll find in little kitchens in homes near take-away food stores in the city. Whether you opt for a walk-in pantry or just make space for lots of extra shelving (bookshelves will do), you can never have too much storage space in an off-grid kitchen. Bottles of dried herbs and home-made sauces and pickles and jams or jellies will all need a home. 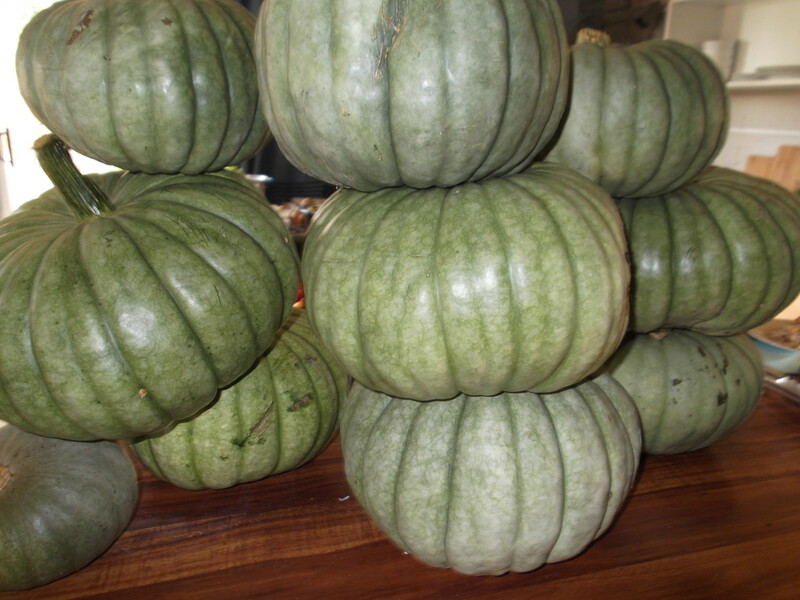 You'll need somewhere to store all your lovely organic pumpkins so they are on hand for making delicious pumpkin soup throughout the colder months. Some foods, like potatoes and carrots, can be left in the ground for on-going harvest if you don't have room to store them indoors, depending on your climate. 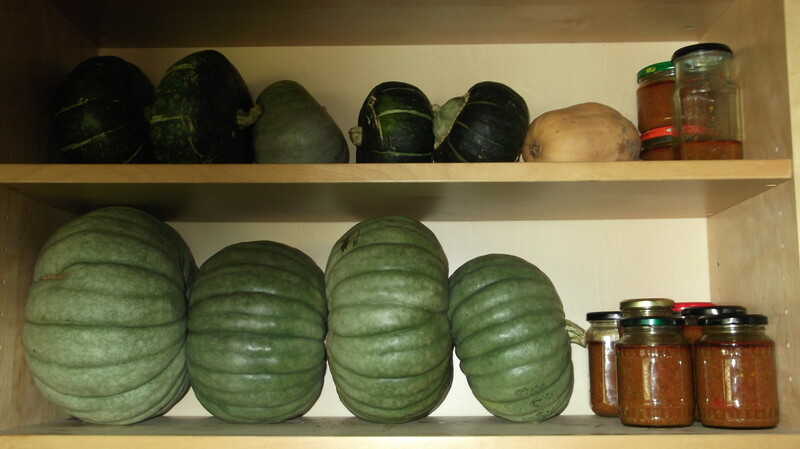 My off-grid kitchen has lots of cupboard space but I don't like to waste that valuable space storing pots and pans, graters and cooling racks. Any kitchen items that have holes in them tend to be hanging from meat hooks in my kitchen. Meat hooks are short and compact, and great for suspending kitchen items. Garden hooks designed for hanging pot plants are also useful in the kitchen. One wall in my kitchen has an entire line of pots and pans suspended from a rail near the ceiling. I am not very tall, but I can easily reach the bottoms of the pans and lift them from the hooks. 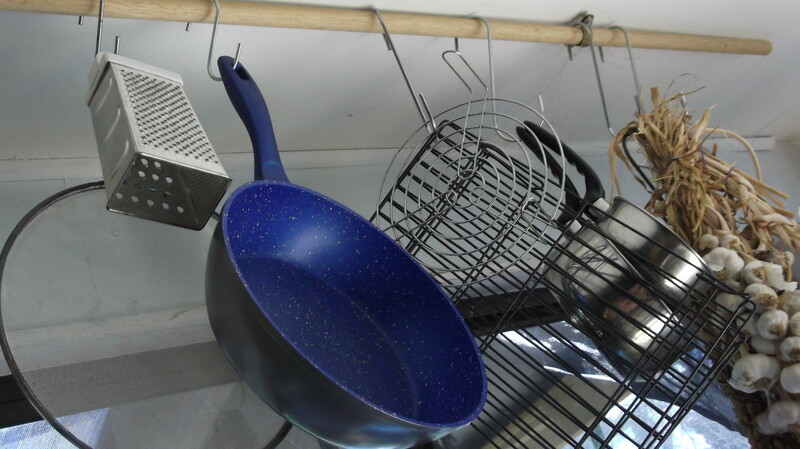 Another section of my kitchen has hooks where I hang cooling racks, strainers etc. Suspended from the ceiling above my kitchen sink is yet another hanging space. When pots and pans are washed, they hang in that area to dry. Any drips fall over the sink area. For the purpose of illustrating the types of things that can hang in your kitchen instead of taking up valuable flat surface areas, I have grouped a sample of items and photographed them. If you want avoid generating heat inside your home during the hot summer days, a barbecue is a very helpful tool for cooking off-grid. So is a solar oven! A review of the solar oven I cook with every summer. 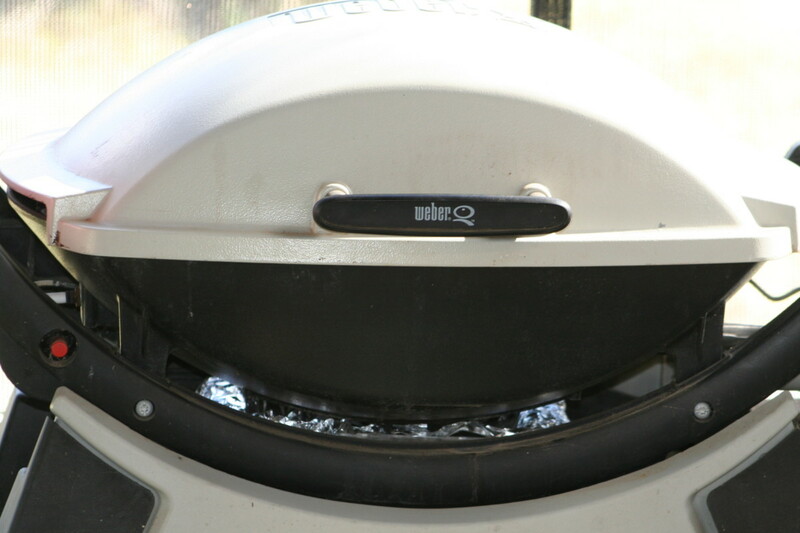 Solar Cooking made easy with 5 top tips for cooking with solar ovens. 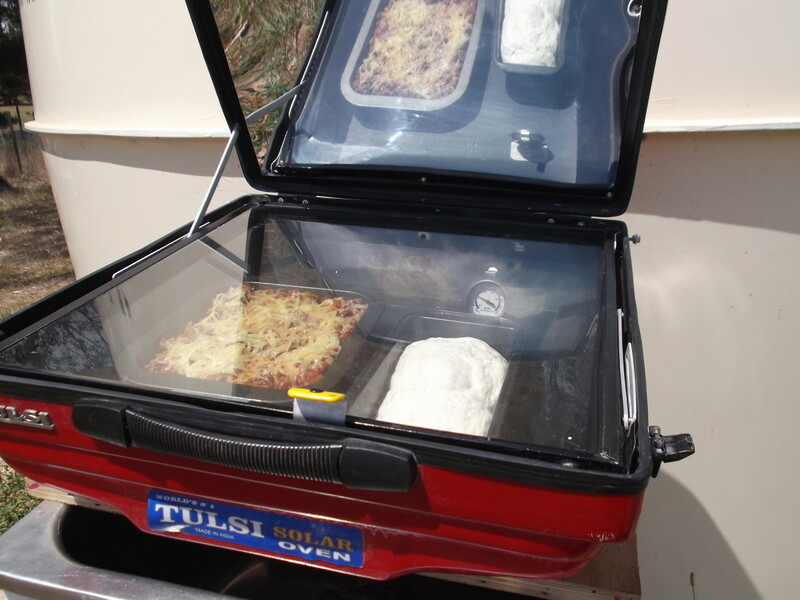 Which solar ovens can cook on cloudy days? And in the dark! Here's some more of my hints to new owners of solar ovens. Generating heat is the fastest way to deplete deep cell batteries, so even if you live off grid with solar power as I do, in winter your oven and stove are likely to be fuelled by either either gas or wood. 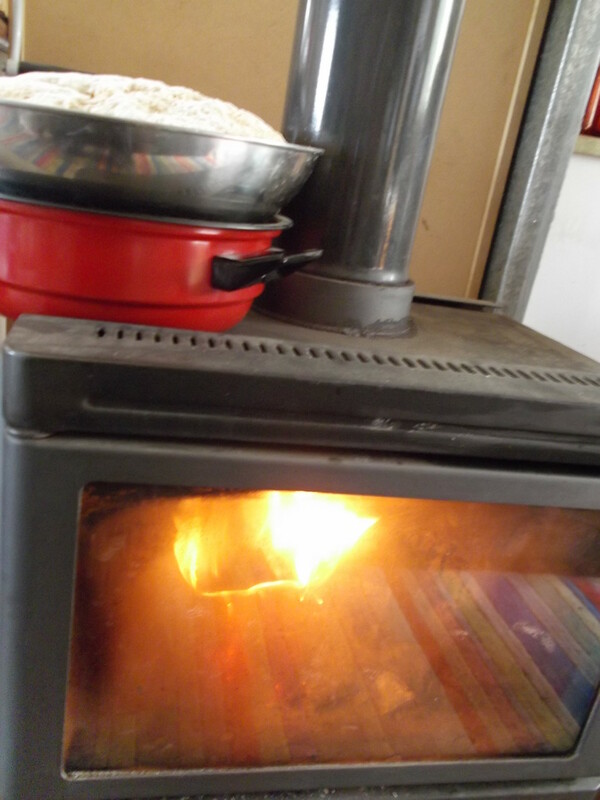 I have had beautiful big wood burning ovens in the past but for the past five winters I have simply used the top of a general wood burning fireplace (pictured), a gas oven or a barbecue connected to LPG (propane). You need to eat, and you need to stay warm. Why fuel a heating source and a cooking source separately? Creative cooking takes on a whole new meaning when the vast majority of your electric powered kitchen appliances become obsolete. Suddenly you begin exploring creative new ways to approach your kitchen and cook up a feast. I have a hand powered juicer, a pasta press, and a grain mill that don't get used all the time, but make cooking lots of fun. When you are out and about, keep watching for simple kitchen appliances and utensils that will make life easier (and more interesting) when cooking off the grid. As an example, I have a brilliant little 'roaster' that I spotted one day and bought. I honestly don't know what it is called because I threw the box away long before I thought I'd ever be writing a hub about it! 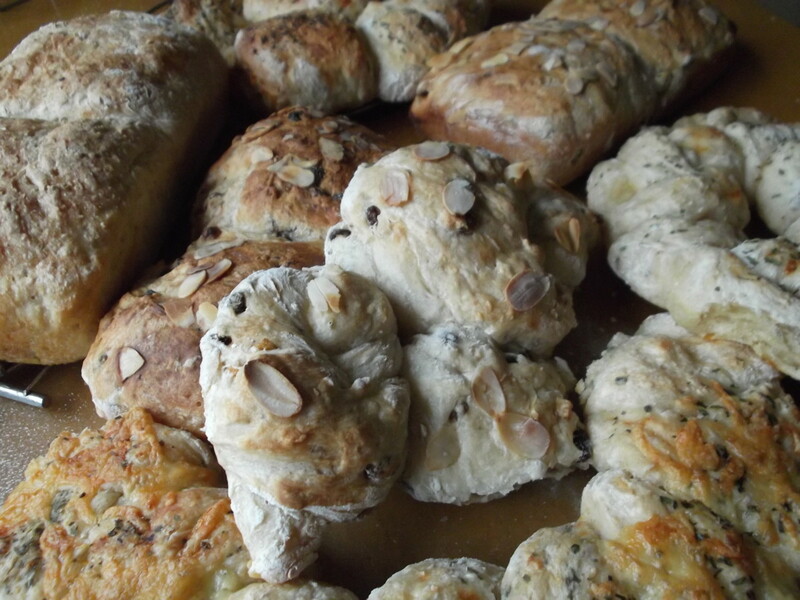 It is large enough to bake all kinds of goodies, and small enough to fit on most standard sized wood burner stoves. When I bought it, the pieces for the handle were in a plastic bag and needed assembly. That was easy. It is very versatile. If I am in a hurry to get my bread in the oven, I sit the dough in a large stainless steel bowl over the base part. My bowl is large enough to stay clear of the direct heat. You can still use electrical appliances when cooking off the grid, but check the amount of power that your appliance will draw from your deep cell batteries. Don't damage your power system by being lazy in the kitchen. 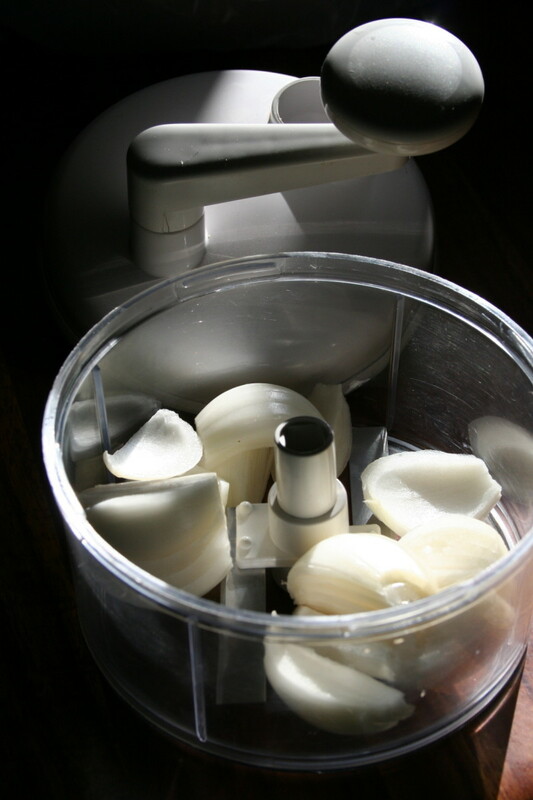 A small hand-held mixer or a range of manual kitchen appliances can achieve the same results as a large food processor. They don't look as impressive, but they make a great contribution to a greener lifestyle. 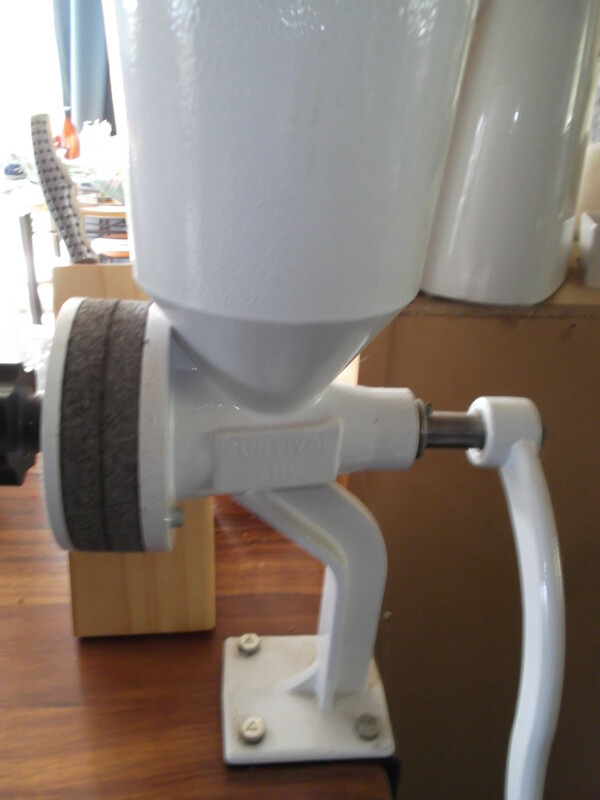 I have a mortar and pestle, but I use a small coffee grinder when I want to grind tough herbs like cumin seed or coriander seed. 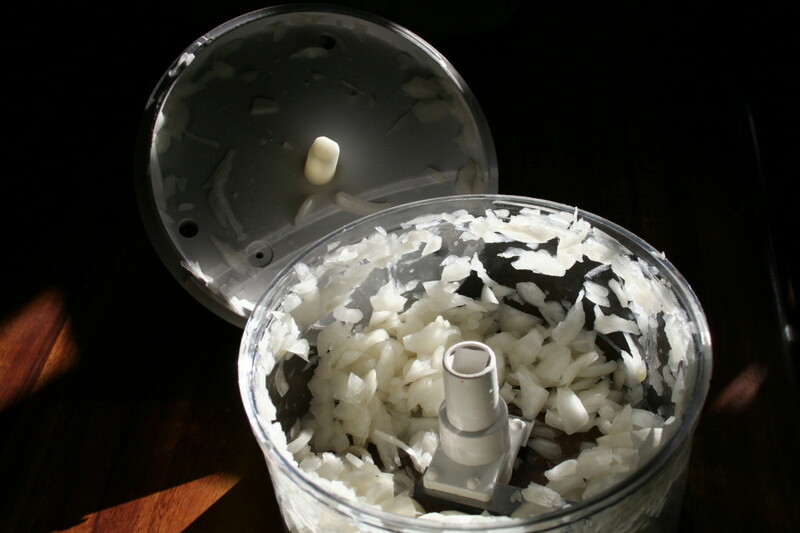 I also use it to mash garlic or ginger when chopping just won't do. If you really want to use a power-sucking kitchen appliance, connect it to your generator (or your house power to your generator) for the duration. 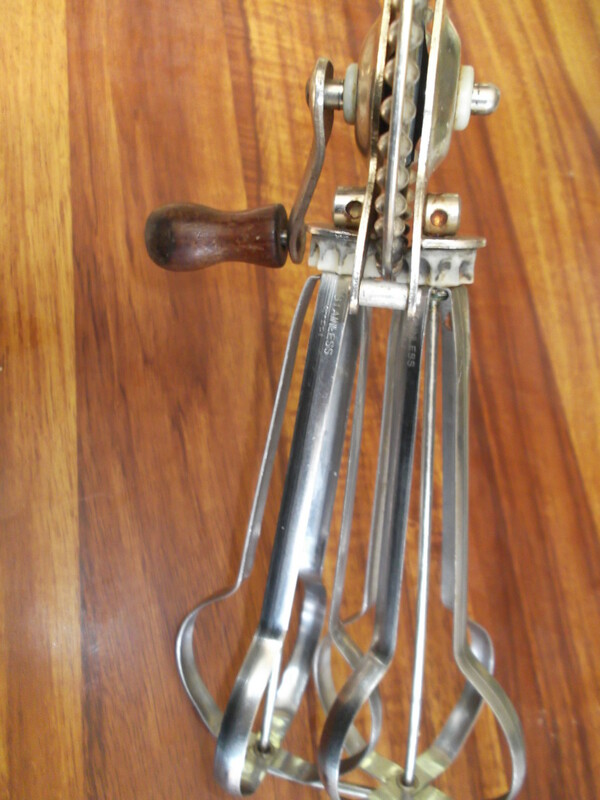 1) It has a stainless steel blade, but a plastic surround. This is very important if you don't want to scratch your special pots and pans when blending foods directly while they cook. 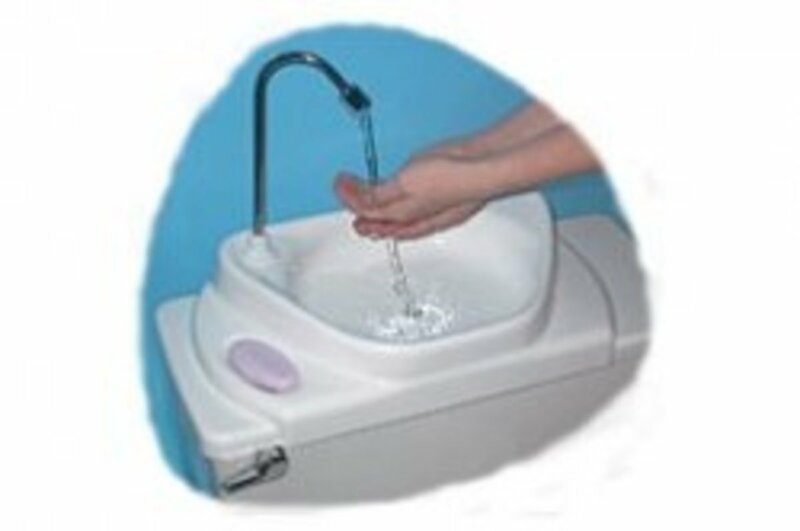 2) It is simple to use and easy to clean. You don't have to search for its many attachments before using it, and with two speed settings there's no difficult decisions to be made. Faster or slower? Simple. 3) It is cheap. Whichever way you look at it, this product is affordable. You don't have to live in fear of breaking it. Work it hard. If it breaks, you can replace it and learn from the experience. 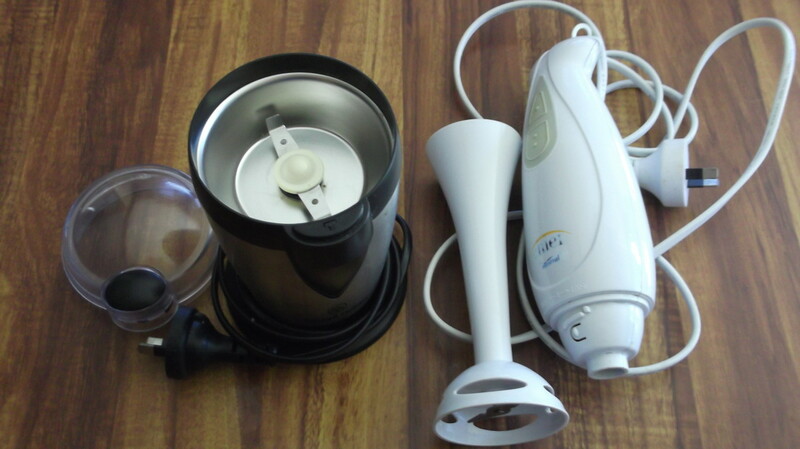 The cost of two of these products will still work out to be cheaper than one more expensive hand-held blender. lol. You can afford to be brave in the kitchen! When you live off the grid, you want cooking to be simple. Of course you need something for cold storage. I have a refrigerator made for RVs. It is big, the size of a standard electric refrigerator. You can buy smaller versions. Getting off the grid can begin with careful choices in solar lights and appliances while still living in your current home. Tips to save money on power and change to a self sufficient lifestyle today. Cooking off the grid is fun for me. Some things take more time, but very few things take more effort than I made when connected to electricity. The biggest change I had to make was a change in attitude. Instead of cursing the fact that I had to cook differently, as soon as I viewed cooking off the grid as a challenge and a chance to become more self-sufficient and sustainable, it became a joy. There are few things nicer in life than spending time in an off-grid kitchen creating healthy and attractive delicacies from your own organic produce. It is remarkably satisfying! Living off the grid can be less stressful and more profitable than the lifestyle you are leaving behind. Here's my top tips to get you started. Are you one of those people who spends a lifetime dreaming about becoming an organic gardener, but never actually doing it? Not only can you see the difference, you can taste the difference. How to Save Money - Should Kitchen Appliances be Repaired or Replaced? Cool article. Having lived on a boat, completely off the grid for years I can really appreciate the challengges and rewards of this kid of life choice. Thanks for the link to this hub…will hopefully start posting about my experiences soon. PS I also love my little green house, plus it doubles for proving bread and yoghurt in winter because it's so warm! Hi FSF. We are heading towards our four year anniversary without power. (I have lived in the country on and off for the past 30 years, often within commuting distance of a city job - but technically 'off grid' means off the power grid.) I've always been an organic gardener and have raised goats and sheep and other farm animals over the years, so all that experience is very helpful now. I have a number of 'arches' made from recycled metal mesh and/or plumbing pipes that are covered with shade cloth in my gardens, plus some really large additional shade cloth covered structures. As well as offering shelter from harsh summer sun and the occasional hefty wind, they also provide frost protection in the winter. I keep herbs and vegetables growing year round, but winter is nowhere near as busy or frantic in the garden as the hotter months. Lots of summer produce has been bottled including tomatoes and chillies and fruit ... and we are working our way through countless pumpkins from our last bumper crop. I still have fresh carrots and turnips and parsnips in the garden because I've found they are better kept in the ground than trying to store them indoors. When we lived in the tropics further north, we could grow all kinds of foods year round because we had no real winter. I'm enjoying having stone fruits, but the pay off is having to collect so much firewood to keep warm on cold days like today. lol. Great Hub , again just as all your other Hubs I have read thus far . Forgive me if you have already mentioned this somewhere but how long have you lived off grid ? Also what planting method do you use to meet your families diet requirements for the year ? You mention closing the garden for the winter . Do you or are you planning a cold frame or green house in the future ? Because there's danger for everyone when they lose power during extreme heat or extreme cold I wrote one about staying warm or cool without power. That might be helpful. And the other most helpful one if you seriously want to use less power (living in a sunny region) is my solar cooking hub. Solar ovens are surprisingly cheap for the many benefits they provide. I feel sorry for you being at the mercy of a power company. There's a few things you can do though to reduce the impact when they let you down. Might be time to make a list of off-grid things to spend your HP earnings on, eh? Okay, I really need to get reading all your 'living off the grid' hubs. I so wish I would've seen this one rolling in when you published it. It was right around the same time the electric company shut off my power and despite jumping through all their hoops to get it back on; I went more than 24 hours without electric and it was all due to a misunderstanding. I despise my electric company, they're abusive... ha ha... okay, I'm laughing but it's not really funny. They charge more for delivery (through lines) than the actual electric usage itself! Not only that, I am fully aware of the condition of our environment and lack of renewable resources and how smart of a human being I would be if I were to use less fossil fuels myself. With that said... I really don't know where to start and I'm not a big waster or electricity as it is, so I really think this is a lifestyle I could embrace. Your hub makes the whole concept exciting and I really feel compelled to learn more and further investigate. By the way... I'm hungry now! Your pictures are fabulous. What a wonderful and thorough hub! Hi Alise-Evon. It surprises me just how much I love being off the grid. I'm lucky to be at an age and stage where it suits me so well. Took a long time to get here, and I think that's the same for most people. Any little lifestyle changes that you make are good. Another nice hub about living off the grid. We won't be able to do all you can where we currently live, but I still get ideas for some things we can do- looking into hand-powered juicers and smaller solar panels to charge deep cell batteries would be two of those things. In all my changes to, what I call a simpler life, you are very right about the need for a change in attitude. For me, it's not been so bad- I love being able to do things that our ancestors did- I have seen it being referred to as "re-skilling" yourself on the internet. I love that phrase. It gives you some sense of being a person with resourcefulness, for your family and for others who may need what you have learned someday, themselves. Ok Que Scout, I'm following that link now to see if this all suddenly makes sense. Thanks. I think it would be a fun exercise to pin your original photos to see if any one page gets more traffic. I will open a folder. The photos will be Googled then clicked on, then sent to the originating hub. So they need to be big, super clear, and depict something singular, subjects like apples, or the thermometer on this page. Stuff like students would Google for to create a project. May I suggest you follow this link to another of my hubs, 'Cooking with sunshine in my solar oven'. 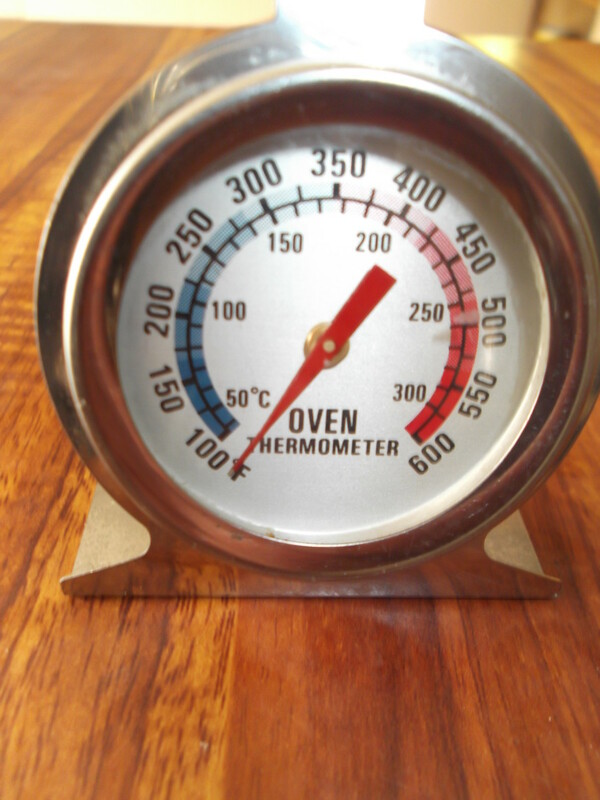 In the comments section, one of the hubbers writes about her experience with a hybrid solar oven. If I was buying a solar oven I would seriously consider hybrid. The hub itself is written about my experience with the basic solar oven. Thanks for visiting me again. I am eager to help you reach your goals!! Hi Que Scout. I enjoy chatting with you. I have to confess I parted with my microwave a long time ago, but without an oven you are left with only a few options. lol. As for Pininterest, I am a complete novice. I've seen pinning mentioned and I've seen the 'pin' button on my photos, but I have not explored that concept yet. I have so many hubs yet to write and the restrictions of satellite internet and solar power to contend with, and I'm not sure how many hours it will take for me to get my head around something new. lol. I do, however, use original photos in all my off-grid and organic gardening hubs. If you pin things, is it possible to pin something of mine please, and then tell me what you've pinned so I can keep an eye on the stats and see what difference it makes? New Hub (sorry I did not notice when it went up) very nice indeed. I like the way you refer back to simpler methods by looking how granny did it. I also like the mention of more suitable pots & pans and a sensible layout of the kitchen. I do not think people would be inconvenienced in the kitchen to much if they take heed. I am a cooking nut, it has got to be the best food every time. I have everything I need to prepare nice meals. However, I do not own many electrical appliances. I get by just fine without juice extractors, blenders, or even an oven. Yep no oven. But I do use a microwave oven which uses red elements to assist. Still a 1000 watts but much less time on. The suggested alternative appliances mentioned in your hub in the past were not readily available, but today, with Ebay etc people living off the grid can find suitable stuff easily. Sorry I am rattling on. One more; I noticed your photos are your own. Original photos can draw 10 fold visitors. Please be sure you have looked at some of the Pinterest hubs. It may be of interest. I can hardly wait until I can get a solar oven. I think I'd like to make it the next thing on my list toward my endeavor to live a grid-free life. Living off the grid is such a neat concept. I'd like to do it in the future, but think I need to master cooking "on the grid" first though ;) Very interesting hub, you have a lot of great knowledge! Thanks aviannovice. 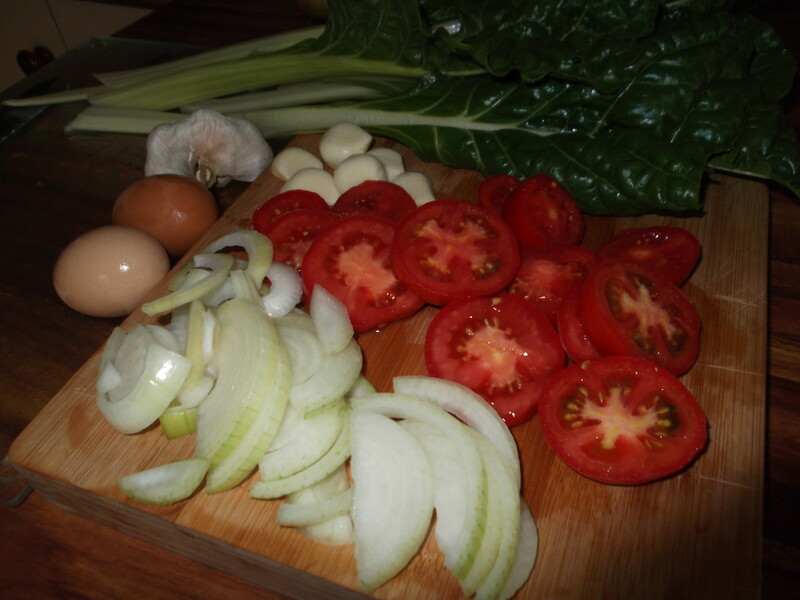 There's a lot of guesswork going on in my kitchen every day as well. lol. You'll laugh when you see how I bake bread! I like to think that even people living in the city will try to be a bit greener and old-style in their kitchens. Off-grid cooking is largely about the way it used to be done. With the addition of new technology like solar ovens, of course. Beautiful work! Growing up, we had very little in an 1800's farmhouse. Mother cooked a lot on and in the woodstove, even though it had a broken thermostat, but she still managed to do bread and pies. We had a hand crank ice cream maker, which we used in the winter, as ice was plentiful in the pond. We had our organic garden, a few ducks for eggs, and got that wonderful raw milk at a farm. Life was good!